Apple is reportedly working to develop a new chip for future MacBooks, one that potentially lets the tech giant push better battery life out of its line of laptops. The new chip has been in development since last year and is based on the proprietary silicon Apple debuted to power its innovative Touch Bar on the latest MacBook Pro, according to sources speaking with Bloomberg. People familiar with the matter say the chip can take over some of the functions currently handled by Intel's processors, allowing Apple to scale back the business partner's role in creating future Mac laptops. One such functionality Apple is rumored to be aiming for handles the efficiency of the MacBook Pro during low-power or sleep modes, potentially leading to a better battery life overall. 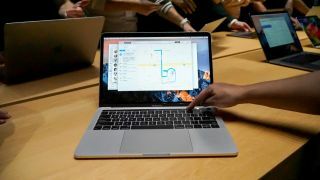 Despite its advancements, Apple's latest MacBook Pro hit a snag with some disappointed consumers, at least in part because of inconsistent battery life. Apple did patch a battery bug in a recent macOS update. Setting aside the chip housed inside the MacBook Pro's Touch Bar, Apple is no stranger to making its own chips. The gadget giant's iOS products have seen plenty of proprietary silicon, from the debut of the Apple A4 in 2010 leading all the way to the Apple A10 used in the iPhone 7 and iPhone 7 Plus. While it's still not known for sure when Apple's latest chip will make an appearance - or what its exact purpose will be - producing more of its own parts independently of Intel may be a worthwhile investment, giving the Apple even more control over its prices and products.